Volume 4, Edition 33 Trouble loading? View this email online. 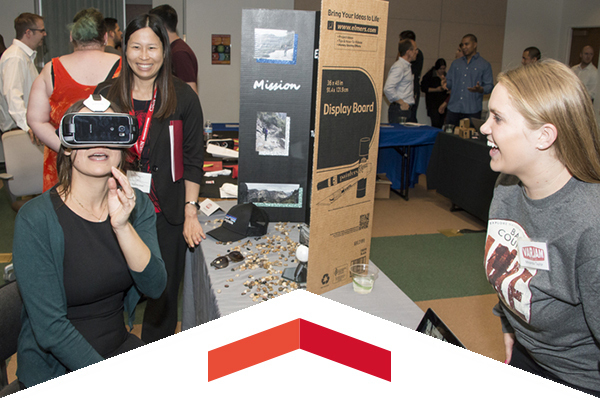 Ten competing CSUN student teams demonstrated their virtual reality and augmented reality projects to fellow CSUN students, faculty and judges at the 2017 VARJAM finals on April 7. 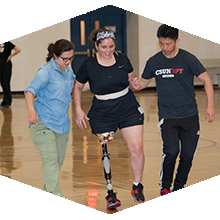 Community members and CSUN physical therapy students came together to offer a full day event of educational sessions, networking and exercise clinics for people dealing with limb loss. The Bull Ring New Venture Competition, a contest where teams of CSUN students connect with business professionals to fund their startup ideas, narrowed the field from 46 to five at the semifinal round on April 4. The finals, which will take place on May 2, will award teams between $5,000 and $20,000 for their startup. Beach Volleyball vs. Cal State L.A.
Thurs, April 13, 3 p.m. The Matadors will take on crosstown rival Cal State Los Angeles in one of CSUN’s final home games of the season. Wed, April 19, 8 p.m. Through a fusion of film, dance and music, Taj Express explodes with the sounds of India and Bollywood, capturing the vibrant, expressive spirit of the world of Bollywood movies that have been entertaining billions of people in India for generations. Sat, April 29, 6:30 p.m.
Join us for the 2017 CSUN Distinguished Alumni Awards where we will recognize Milton Berlinski ’78 (Computer Science), Mike Darnell ’87 (Communication Studies) and Patricia Maloney ’80 (Chemistry). 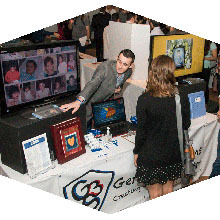 For tickets and tables, head to the Distinguished Alumni Awards website. CSUN’s Child and Adolescent Development Alumni Chapter invites you to campus for its Celebrating Excellence Awards Banquet. The chapter will recognize exceptional CSUN students, outstanding alumni and members of the CSUN community. CSUN Athletics and CSUN’s Marilyn Magaram Center have announced a unique new partnership that will help the two programs create and grow mutually beneficial nutrition and wellness programming. CSUN’s Asian American Studies Department, Middle Eastern and Islamic Studies Program and Muslim Students Association invite you for a one-day visit to the National Historic Site at Manzanar on April 29, where approximately 10,000 Japanese Americans were incarcerated during World War II. Attendees will meet at the San Fernando Valley Japanese American Community Center and must RSVP. Join Communication Studies alumni, students and faculty for an evening of celebration and networking to honor the accomplishments of current students, graduates and faculty on April 19 from 6 to 8 p.m. in Manzanita Hall.